A shallow stitched Nantucket basket with wooden base, rim and arched handle features a diminuitive hexagonal berry band tussy drawn closed with a complimentary silk ribbon tie. 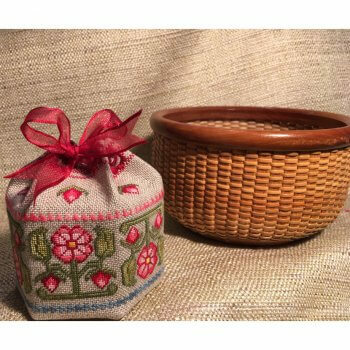 The stitched basket is lined with a designer silk and the handles are attached with turned ivory knobs. The tussy is stitched on a 27-count linen banding with red striped edge using all Gloriana silks in over-dyed reds and pinks, three shades of green and yellow. In addition to the strawberry motifs, a stitched upper and lower band is executed in the overdyed red/pink and the dusty blue silk. The two-inch basket weaving is stitched to effect an actual Nantucket basket under a cherry wood rim. This is a charming accessory for the traveling Island stitcher.